We are pleased to tell you that after many months of work by our volunteers on your behalf the Draft Emsworth Neighbourhood Plan is now published for public consultation. Print copies can also be viewed at the Emsworth Farmers Market on 18th November and 16th December 2017. You can express your views on the Draft Plan through an online survey here >>>>>. You will be asked questions about each individual policy so it may take up to 30 minutes to complete depending on how much you want to say. 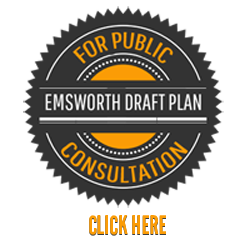 The Draft Plan will also be presented to the Emsworth Forum AGM and Public meeting at the Emsworth Community Centre between 10-12am on 16th December 2017. Mulled wine and mince pies will be available. All representations will need to be submitted by 17:00pm on Tuesday 19th December 2017. Once the consultation finishes, the Forum Committee will consider your comments, and those of the ‘statutory consultees’, and make any necessary changes to the Draft Plan to take those views into account. We then submit the Draft Neighbourhood Plan to Havant Borough Council for them to conduct a further public consultation and appoint a Planning Inspector who will formally and publicly examine the Draft Plan to check that it is compliant with the law and that we have followed the proper process in creating it. Once they are satisfied, the Plan will be put to the electors of Emsworth ward in a Referendum. We hope you will be as excited about it as we are and we thank you for your patience and all the support you have given us during the time we have been working on it. 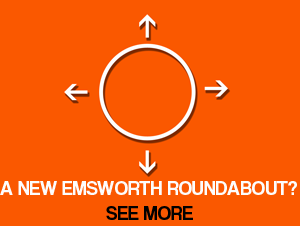 EMSWORTH ROUNDABOUT – WHAT DO YOU THINK OF A NEW DESIGN? If you would like to help us organise the public consultation please contact our Chair Stephanie Elsy at stephanie@stephelsy.net or on 01243 379973. If you are able to help us with the costs of printing posters and leaflets please do so by contacting our Treasurer, Jan, whose details are set out below. Any donation no matter how large or small will be greatly valued.